The Hurricane Creek Preserve is a very large and intensely managed, high fenced hunting area containing some of the best whitetails in the world. The best part about hunting with Hurricane Creek is that all hunts are Guaranteed! (See the Rates Page for details.) Hurricane Creek is absolutely a 1st class experience! Hunting at Hurricane Creek is strictly limited and subject to availability. We suggest booking early to reserve your spot. The Preserve Doe Hunt is a great way to stock up your freezers! We offer an “add on doe” to your hunt, and we also offer a 2 day doe hunt spread over a 3 day period beginning January 22-February 10 2017. This is the perfect way to close your season with some quality deer meat in your freezer and to fellowship with your friends and family and talk about all the tales from the deer season. Come join the fun as you will receive the same VIP treatment that you get with any Hurricane Creek Hunt! 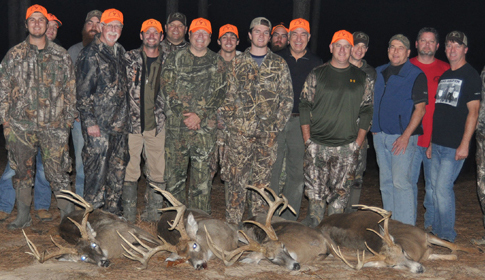 Alabama State law allows 1 doe per day per hunter. These hunts will be subject to availability. One-On-One Guide Service is included with your stay at Hurricane Creek Lodge. With One-on-One Guide service, we will sit with you in the stand to help you judge your trophy in the field and video your experience for a lifetime memory. You will enjoy numerous stands located over food plots and along travel routes in the hardwoods. We recommend hunting the travel routes in the mornings and food plots late afternoon. Our entire staff will do all we can to get you the trophy you’re after and make this a hunt of a lifetime. be pleased with the game you see. After that, it’s all up to you!